Les Rotes hotel lies ​​in the Montgó nature reserve, just 100 metres from the famous Les Rotes coves and bays which give the hotel its name: a dream of crystal clear waters in the San Antoni’s Cape Marine Reserve. We are talking about a hotel whose business has thrived due to smart management, always improving and going the extra mile for their customers, hence the excellent reputation! The hotel features a beautiful outdoor space with a natural cane roof; perfect for open-air wedding ceremonies. Les Rotes is located in the Dénia area, near Valencia, a perfect microclimate with mild winters and warm summers with sea breezes carrying fresh air at night. 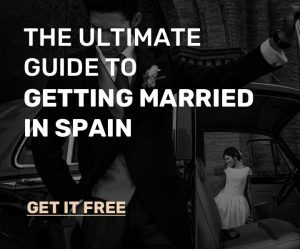 The landscape is so beautiful you will want to walk the few yards to Cala Punta Negra beach for your wedding photos, and just let the amazing Mediterranean Sea be your backdrop. The hotel accommodation is splendid, furnished with taste and grace, a combination of modern and quaint. What’s more, it has two pools, a central pool and a smaller one on the rooftop where you can lie down and admire the astounding star-filled night sky while enjoying a drink. The hotel will cater for your whole wedding, providing input on food, decorations and entertainment; it’s also very family-friendly. The management is both experienced and welcoming and the location is logistically perfect, close to Valencia Airport, and with train stations and motorway links to the rest of Spain.